Below we have included links for biking safety rules and maps. Our bikes come with safety helmets, lights that turn on automatically, locks, etc... Be safe, and enjoy the ease and pleasure of cycling in Key West and the Florida Keys. 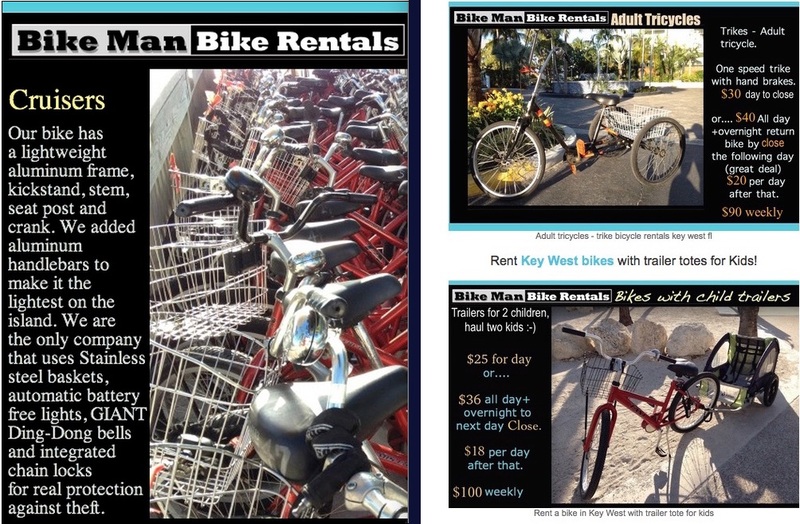 Bicycle rental in Key West for everyone, tourists, locals and biking choices for families. Rent our bikes at the Reach, The Casa Marina, Red Doors, Sunshine locations, and more. 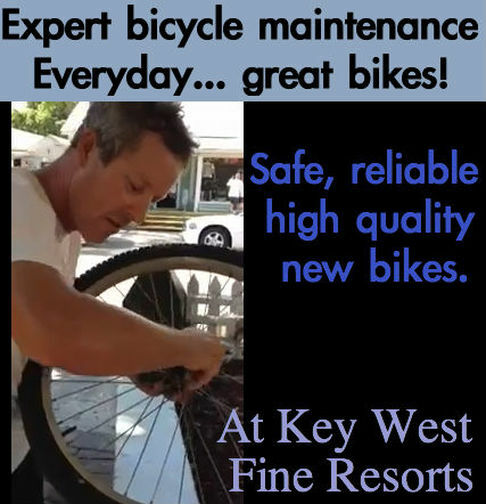 _Rely on the Key West Bike Man crew for your bicycle rentals, biking in Key West with one of the most trusted companies. With an extensive variety of bikes in top luxury Florida Keys resorts, at some of the best places to rent bikes in Key West Florida. No gas or trucks, the crews believe in conscious earth conservation and use hard work and bike trailers to maintain a "green" policy! Info about our cruisers, and some of our bikes for kids. See more options on our Key West Bikes link page. Conch cruiser bike rental in Key West FL and other bicycles too. We've got a broad range of bicycles for rent, hybrids, touring bikes, multi speeds, tricycles, tandems, anything a family needs for biking in Key West. 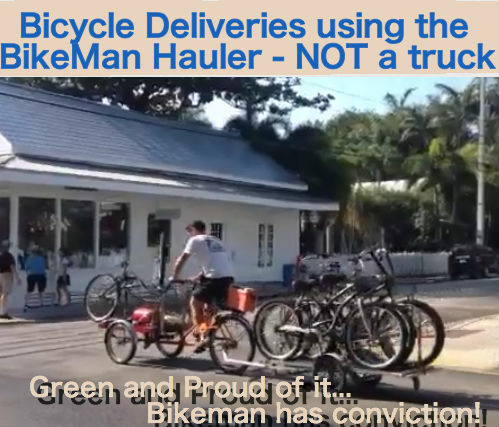 Video Bicycle rental in Key West. For map of biking trails in the Florida Keys starting at Key West Florida, USA try www.bikemap.net - a good web site source for bike paths and routes from other cyclists. Click and see their routes and destinations! At http://www.dep.state.fl.us/gwt/state/keystrail/bike_trails.htm You will find suggested Bike trails in Key West and in the Florida Keys. Contact Key West Bike Man rentals today to book in advance and get multi day discounts and great group rates too! Any kind of bikes, Key West conch cruisers to kids bikes, tandem bicycles, hybrid speed bikes, bikes with baby seats, and much more! Biking in Key West Florida on a rental bicycle is one of the easiest ways for getting around Key West, and it's tons of fun.